Elim Beach? I’d never heard of it until a respected 4WD traveller described it as ‘one of Australia’s best bush-beach camping spots’. That was several years ago, but I can report that little seems to have changed since then. ‘You mean Ellis Beach, between Cairns and Port Douglas?’ most people ask. Nope, I mean Elim Beach, about 100km or so further north up the coast, across the Daintree, via Bloomfield, Cooktown and Hope Vale. Still none the wiser? Well, find Cooktown on your map. Look above it and you’ll see a large east-facing bay bracketed by Cape Bedford in the south and Cape Flattery to the north. It’s there, about one third of the way up. Sounds tricky to find and access? Nope. In fact, depending on which way you travel, you’ll travel less than 30km off the bitumen from any Australian capital city to get there and the broad, unsealed road that forks into a narrow, sandy bush track for the final 500m should be fine for any on-road van with average ground clearance, towed at sensible speed by a 4WD. So why isn’t everyone there? Well, for a start, it’s off the beaten track for most caravanners, many of whose notion of civilisation stops at the Daintree River. Meanwhile, most Cape York adventurers are impatient to get to the Tip, so they take the high road across the Sussex Range via Mount Molloy after Atherton or Port Douglas, before leaving their on-road vans at Laura where the bitumen stops, and continue on with just their tow cars and tents. 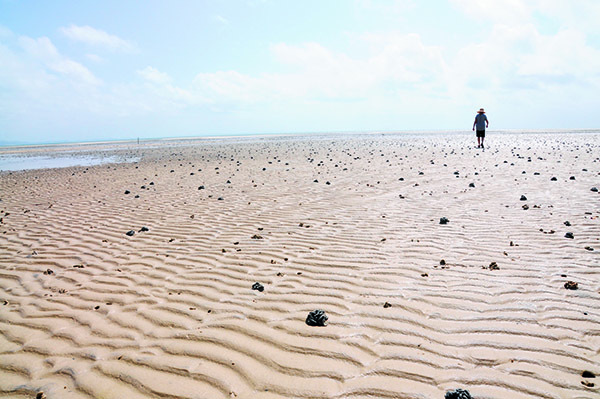 However, if your destination is Cooktown, do something only a little more adventurous and include a few nights Elim Beach on your itinerary. The easiest way to get there is via Cooktown, from where the sealed Endeavour Valley Road takes you 48km north-west to the Aboriginal community of Hope Vale. The alternative access to Hope Vale, for those returning from the Cape or planning to heard there afterwards, is via the unsealed but generally well-graded Battle Camp Road. From Hope Vale, this road takes you 70km due west to historic Old Laura, which is 25km from Laura and the Peninsula Development Road. It’s a scenic route but, from the south, it’s much quicker to turn right at Lakeland and travel via Cooktown. At Hope Vale, your main challenge will be finding the Elim Beach Road but, if you follow your nose through town, it’s the only road heading due east. 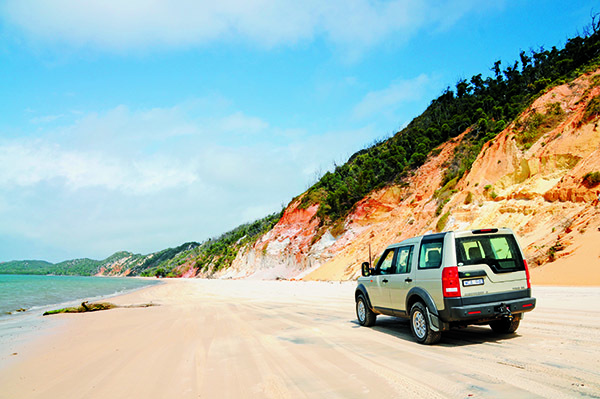 The 30km drive from Hope Vale to Elim takes 45-60 minutes on the unsealed road that winds through white silica sand hills, rugged escarpments and heath lands. Take the (signposted) right fork just short of the beach and the campground is about 200m on the left. If you would prefer more formal directions, a map can be obtained from the service station at Hope Vale. 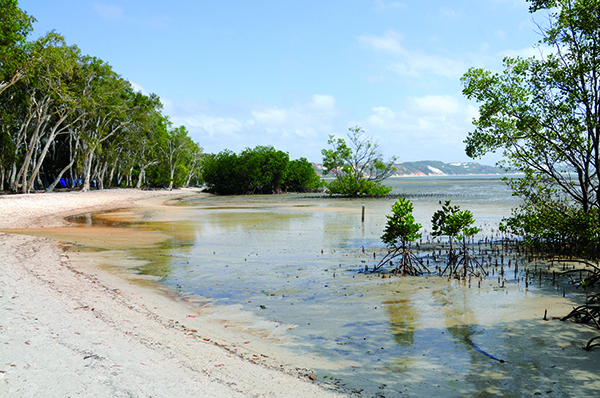 Elim is home to the famous Coloured Sands and is now also a popular fishing spot for locals. 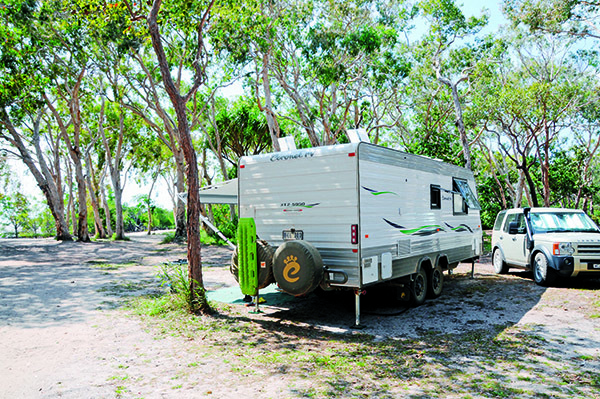 The Elim Beach campground that belongs to traditional owner and Thiithaarr-warra elder Eddie Deemal is right on the water’s edge just south of the Coloured Sands, with great views south across the very tidal bay to Cape Bedford. You can buy the required camping permit at the service station in Hope Vale before you leave, or you can just square up the $10 per person cash fee with Eddie when you arrive. Now, don’t expect anything fancy when you get to Elim, and the badly weathered sign marking the entrance gives you fair warning. Most likely, you’ll find Eddie relaxing in his armchair on the balcony of his home opposite the campsite’s rudimentary facilities that include a ‘camp kitchen’ and flushing toilets. If you are after a BIG4-style caravan park, you have taken a wrong turn. 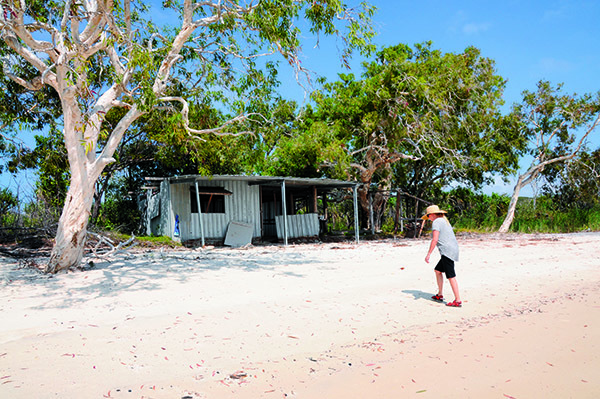 This is about relaxed and informal beachside bush camping, and nothing more. 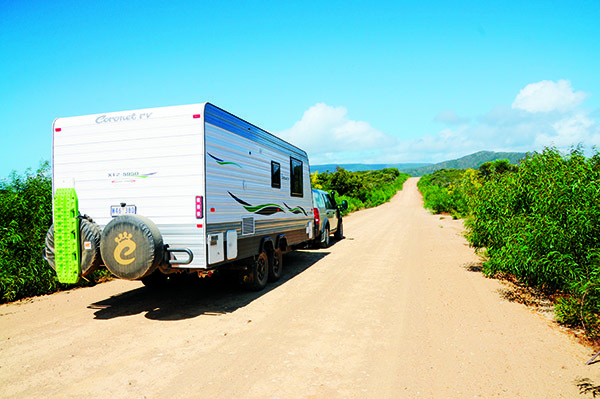 After paying your fee, you can choose your campsite, right up and including the water’s edge, which some with light camper trailers do. But with close to three tonnes of tandem-axle Coronet XT-2 caravan behind us, we stuck to firmer ground and made our ‘home’ about 40m from the sand, with a largely uninterrupted sea view. ‘Further from the crocs’, we also thought, although we didn’t see any. There is no camp barbecue but you can have your own fire in a clear area next to your campsite on non-fire ban days and there is plenty of fallen timber around the site. Then, when the fire is crackling, you can enjoy a cold beer or other beverage at sundown, provided you stick to the alcohol restrictions which are in place in this area. Most other things are also pretty casual at Elim Beach, which Eddie built on the site of a former coconut plantation in the early 2000s. His house, built in 2001, winds around a giant mango tree and it is worth taking the time to chat to him about the area’s history and its Aboriginal heritage. 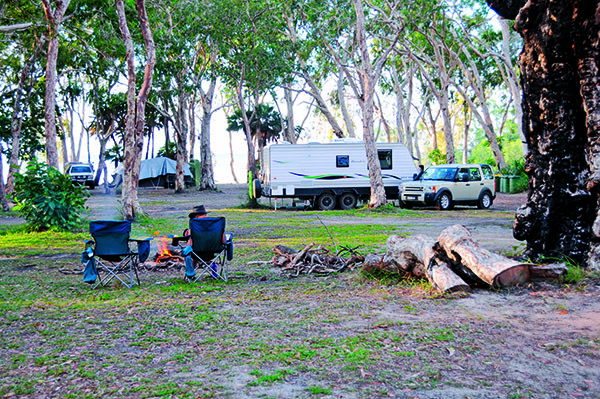 The beachfront campground is shaded by mature paper bark trees, perfect for setting up the hammock, and idea to spend a few days soak up the tranquillity of the area. There are plenty of opportunities for fishing, best exploited with a tinnie, which can be launched from the beach at high tide and moored there for the rest of your stay. You can even explore the coastline by boat to Cape Bedford in the east, or McIvor River to the north. However, the main visual attractions of the area are the mesmerising dune formations of the neighbouring Coloured Sands, which are just a 300m walk north along the beach. Alternatively, you can exit the camp and drive there along the beach, but this is something you should do only at low tide and in a 4WD. 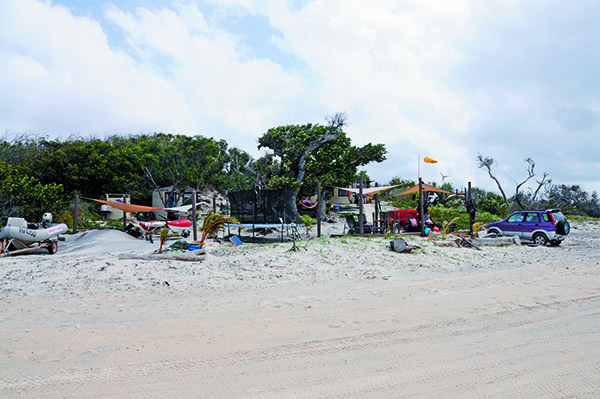 Walk the other way south and you’ll come across many beachside shacks in various stages of disrepair thanks to two cyclones that struck the area in 2013 and 2014. These are effectively weekend ‘squats’ used by Hope Vale people, who are drawn to the area for its fishing and, once, its turtles. Eddie would like to see them all bulldozed, as he laments the over-fishing of the area and the diminishing birdlife. He also said the Coloured Sands themselves are being eroded by people digging out the most colourful hues from their base for sand paintings. The Lutheran Church originally established the community in 1886 as the Cape Bedford Mission at Elim Beach. During World War II, the military interned the German Lutheran missionaries and the population evacuated to southern communities such as Woorabinda. More than 28 deaths were recorded from disease after the evacuation. Over the next eight years, more than a quarter of the population died. In September 1949, Hope Vale was re-established as a Lutheran Mission and the first families returned in 1950. Due to a lack of reliable water supplies at Elim, the community moved to its current site about 20km inland. By bitumen to Hope Vale, via Cooktown, then 30km unsealed road and 200m of sandy track.